Which is a better E string on a German violin? My E string, a Zyex which is getting older now, is making a terrible sound. Almost like an extra vibration or you make call it a whistle. I just don't like the sound. I am thinking of going with the Kaplan or the Pirastro? Any thoughts on which string. When I change it I will be putting on a Hill tuner so I need loop end. I don't really want to use the adapter. I've tried one set that had the option for either wound or solid E and I used the wound. I liked it better. The timbre wasn't such a drastic change as with the solid E strings compared with the other wound strings in most sets. Solid E strings seem to tend to have a very piercing sort of sound compared to the wound strings in the set. Probably just exactly how some folks like it, but the wound E was probably my favorite E of ones I've tried so far. Am I the only one who prefers the brilliant sound of an unwound E? If you are concerned about whistling, then I think the Kaplan E string is supposed to be whistle-resistant so you are headed in the right direction. @Ferret: Overture Ultras, they come with both a wound and a plain E in the set. Kevin, I change E strings quite often. Since they are thin they just tire much quicker. The wound ones don't last as long IMO. I would try the Pirastro "Gold Label" E string. (not gold plated). This is one of my favorite all-round E strings for changing out of the sets. You know, Kevin, the only one thing i've figured out for myself about strings (any strings and especially E) - is try them and observe. 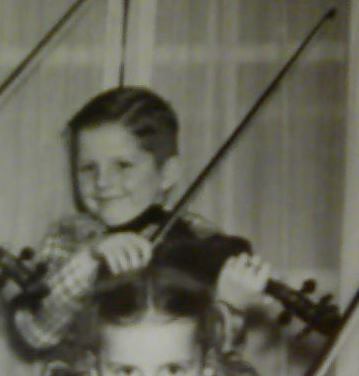 For example i have 2 violins and the same strings sound different on different violin. I've put recently Pirastro chromcor on my A.F. Kohr and was frustrated. Low response, hard to play in high positions. I've put the same string on Barry's german lady (O.J. Klier) and it sounded fairly nice... Same thing was with Thomastik spirocore. Yes I looked into that string also.When I get some money I will order it and some new strings. Now my biggest dilemma, The G string from my Zyex set sound real good yet. Do I get a new D and A Zyex and a Pirastro Gold E or how about a set of Pro-Arte and Pirastro E and leave the G on the violin. Decisions decisions decisions. I'll try to call Fiddlershop. LOL, How about more details Kevin? I'm Zyex biased and would recommend the new Zyex set. However, you may not need to change the G string yet. As far as the E string is concerned, experiment away. The Kaplan E is pretty good too. Is Kaplan E softer and thus easier to play? When I used Dominant I didn't notice much (or none?) calluses on my finger tips, then I tried zyex (I bought four sets when it was on sale at amazon.com using my gift certificates, probably shouldn't have because I don't burn out my strings as fast as the fiddlerman and I still have three sets laying around), then I tried pro-arte (only bought one set this time) and I notice a lot more calluses on my finger tips. The other adult student told me what strings she uses and when she demonstrated it, it seemed like the Kaplan E was a lot easier on fingers. I am willing to try Dominant aluminum wound E or their new Tin E, but better use up my zyex first. Maybe I could let my daughter try the wound E on her violin, because I think her E could be a little warmer to match with her lower strings. I do like zyex on my Gliga violin, all strings sound cleaner than Dominant but zyex did not sound as good as pro-arte on my Stainer copy. I ended up buying another set of zyex and the pirastro E.
That just goes to show you that all strings sound different for different instruments Pky. Remember that Dominants are a HUGE favorite amongst so many players. As far as calluses go, I believe that would have to do with the tension of the strings that you choose. It may just be that you are playing more often and for longer hours too. Pro-arte, if anything, would be softer on your fingertips. I'm probably posting in the wrong thread, but here's an article that touche's on different type's and brand's of string's. How does one choose a string for one's own violin, since different string's sound different on each individual instrument and to the individual listener. Trying different string's and different combination's can get mighty costly. "Hmmm.. I just purchased a set of expensive, "X-brand" string's and I'm not happy with the sound of the D string, plus the E string whistle's when I play it open after crossing from the A string and the A string has a very shrill sound, what shall I do now", they sound nice on my other violin. "So-n-so, said he tried, "Y- brand" string's and they were great, I tried them and was not at all happy with the sound". There are so many option's and variable's when it come's down to making a violin sound good. Taking some of the "shrill" out of the A string can just be a matter of moving the sound post 1/2mm to the bass side or moving it back or whatever, (not recommending starting to mess with the sound post if you don't know what you're doing), but it could be something simple like that. I've tried the "Kaplan Golden Spiral" and the "Kaplan Gold Plated" E-string's and so far I've liked the "Kaplan Gold Plated" the best with the exception that it whistle's, so I just ordered another set of "Zyex" and the "Kaplan Non Whistling" E-string and see if it help's. We also tend to forget that some of us (including myself) are trying to get a million dollar sound from a reasonably inexpensive violin and what may not sound good to our ear my sound just fine to another's ear's. OH,, I almost forgot, here's the link. @ pky: I don't know if the, "Kaplan Spiral E" is softer, but I do know the "Kaplan E Gold Plated E" is nicer to play. In May, I put on a new set of "Zyex" along with the gold plated E, after a couple month's I changed to the stock Zyex E and only played it for about one hour, the stock Zyex E was like playing on a razor blade compared to the gold plated E, it felt like it was cutting into my ring and pinky finger while playing the same song as when using the gold plated E.
I, (like Fiddlerman) am also biased on Zyex.